Mike Thurk just sent us this photo from the Eiger Trail. He and his group embarked on a nine-day trek across the Berner Oberland region of central Switzerland. This is a glimpse of Day 2, the stage from the glitzy resort town of Gstaad to the tranquil farming village of Lenk. Notice the strange limestone formations in the foreground. There’s a place on the Trutlisbergpass, the mid point of our hike, where the limestone has been hollowed and carved by the dissolving action of water and CO2. Geologists refer to this dramatic environment as karst topography and the result, though you can’t see it in the photo, is a dramatic display of whirlpool-shaped sinkholes, gnarly outcroppings, vertical shafts and more. I’ve often wondered what the subterranean network looks like. Karst ecosystems usually contain mysterious worlds of serpentine caves, disappearing streams and gnome-sized tunnels. 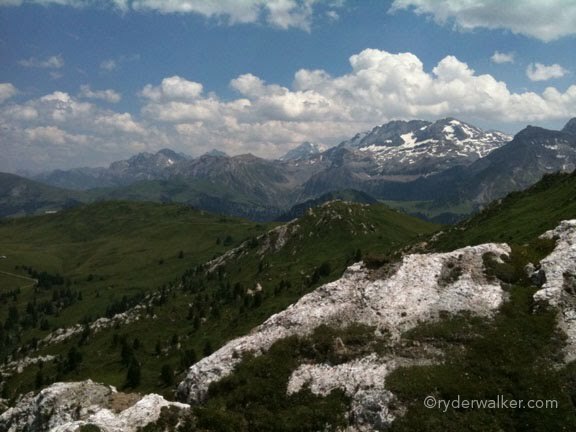 This convoluted landscape gradually gives way to the high peaks of the Berner Oberland. The benefit of hiking from west to east in this region is that the first few days offer a nice warm up before the trail turns skyward toward the Eiger, Monch and Jungfrau peaks.